During the month of October, Fingerprinting Express is excited to be celebrating fifteen years in business serving Nevada residents and organizations. Here is a look back at how it all began and where we are today. In 2002, Becky Riersgard went to a local police station to get fingerprinted for her new job. After waiting over two hours to be fingerprinted with one person ahead of her in line, she realized there had to be a better way! After doing some research, Becky learned that in 1998 new laws had ended the one-sided law enforcement agency monopolies on civilian fingerprinting and background checks for non-criminal civilians. Recognizing the market for these services, Becky jumped into the fray of small business owners who had begun providing these services. Most of these business owners, like local UPS franchisees, began fingerprinting as secondary services several years later. Others began fingerprinting out of their vehicles. In 2003, Becky opened a 600-square-foot store on the second floor of a small Reno shopping mall. On her first day, she made a whopping ten dollars! With limited advertising funds, Becky looked for creative ways to generate business. She enlisted the help of her daughter, Monica, for ideas which would help propel Fingerprinting Express forward. With Monica’s input, Becky began visiting human resources departments at local casinos, armed with boxes of doughnuts, for the opportunity to sit down with HR executives to pitch her business services. Slowly, she began to get new hires coming in to have background checks done for their gaming cards. Over time, with word of mouth and referrals, Becky’s business began to grow until she became the “go-to” for several different industries and businesses. Because background checks are required by state and federal law for several industries, including healthcare, bus and cab drivers, education, financial services, casino, youth, volunteer and numerous other industries, Fingerprinting Express was positioned to become an industry leader in Nevada. Becky and her staff became trained in the use of Livescan inkless technology, and once mastered, Fingerprinting Express gained a competitive edge over others in the industry. Livescan technology allowed customers to get high-quality prints by having all fingers scanned to create a digital image which was then electronically transmitted directly to the FBI and state law enforcement agencies to be run through their databases. Not only did Livescan eliminate the need for messy ink-based fingerprints to be taken, it was also more accurate for lower rejection rates (less than five percent) and yielded exponentially faster results. She put an emphasis on excellent customer service. She offered convenient one-stop shopping by expanding services to include passport photography and notary public services. She trained the staff to master the Livescan equipment, which was challenging because Livescan manufacturers didn’t provide much in the way of product training. Unfortunately, Becky’s husband fell ill in 2012, and Becky recruited her daughter Monica and son-in-law Dave to take ownership of Fingerprinting Express so she could care for him. Monica and Dave were no strangers to business. Dave had worked his way up from the bottom of the casino industry. After his talent and potential were recognized by management, he was selected for Steve Wynn’s elite three-year management MAP training program. After that, Dave became director of the marketing department at the Bellagio resort and then eventually secured a VP position with MGM Resorts International. Monica, who had come to Vegas as a young single mother, became a successful high-end real estate agent in the booming real estate market. She eventually started a business called Vegas Passport, which sold lucrative VIP guest packages to restaurants and nightclubs in coordination with resorts and online travel agencies. It was through this business venture that she met Dave, who was managing partner at the Mirage’s Revolution Lounge nightclub, which was struggling to draw in guests. With Monica’s marketing consulting, her services began to fill seats at Dave’s club. The two began dating and were married in 2009. By 2011, the two were ready for a change of pace. When Monica’s mother Becky reached out in 2012 to get help with Fingerprinting Express, Monica and Dave moved from Las Vegas to Reno with the intent to prepare the business for sale. Because Monica had consulted with Becky from the beginning on all aspects of the business—from strategy and operation to naming, branding, and marketing—Monica was excited about the opportunity to improve the store and create a powerhouse local business that supports and nurtures the local community. Treat customers with hospitality, gratitude, and professionalism. Respect customers’ privacy and needs. Strive to serve the customers’ interests at all times. Monica also launched an aggressive marketing campaign to build relationships with human resources departments for major employers in the area. She boosted Fingerprinting Express’s online presence and began receiving calls from around the country from people looking for a store in their area. It was then that they realized the enormous untapped potential of this market! Monica and Dave started making plans to franchise the business. Fingerprinting Express experienced tremendous growth. By gaining intimate knowledge of state and FBI fingerprint-processing procedures and governmental policies, Fingerprinting Express became highly regarded as the gold standard in the industry. So much so that some state agencies have worked with them to perform real-world testing on programs before fully implementing them. By 2014, Monica and Dave had all the requirements and processes down to a science and began offering franchises for sale. Monica opened a new store in Carson City in 2015, followed by two new Las Vegas locations: one on South Rainbow Boulevard in 2017, and one on East Flamingo road in 2018. With Fingerprinting Express’s unparalleled success, there is no limit to where they will go next! Through its Culture to Care™ program, Fingerprinting Express has donated over $60,000 in fees and services for volunteers, active military, educators, and non-profits since 2016 as a way of giving back to a community that has fully embraced them. $500,000 in fingerprint fees have been discounted since inception. Fingerprinting Express has also done free fingerprinting events for Nevada Child Seekers, an organization that works towards the prevention, identification, and location efforts of missing or exploited children. They also provide free Child Identity Kits at all four locations. The Reno store will move from the Reno Costco shopping center to the Smithridge shopping center in January 2019. Nevada residents can expect to see more Fingerprinting Express shops popping up soon. If you are interested in partnering with Fingerprinting Express for employee screenings, becoming a franchisee, or want to learn more about our services, give us a call at 1-800-919-0227 or fill out a contact request form online. Fingerprinting Express is dedicated to serving communities throughout Nevada. We assist organizations and businesses with our employer support program and we also help individuals that need fingerprints, background checks, notary public, secure document shredding and more. 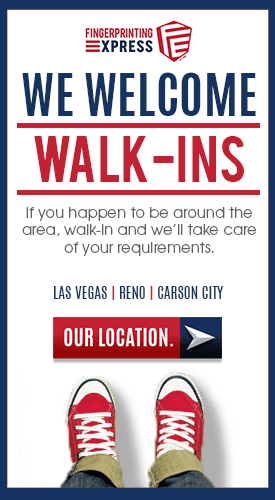 Contact us to learn more or you can walk into a store location near you, our friendly staff is standing by.